Sleeps 6. 2 Bedrooms. 1 Bathroom. I have been here twice now, once with a group of friends and another with my partner and have enjoyed it both as equally. Two very nice beaches just a short drive away and a closer beach just up the road, good for surfing. Very nice cottage, love the open space upstairs. Would recommend! The house is very pleasant, many open spaces, very clean. The little village is quiet and nice. Very close to nice beaches. The owners are helpful and available by phone. The kitchen equipment could be more appropriate for 6 persons (small pans) and the internet is "available" but not included (need to get a paid card for access). All rooms are independant and opening to the patio. Small bathroom. Still very suitable for summer holidays. Yes we have a brilliant time. There were 4 of us lads, plenty of room and plenty to do. Very clean, locals friendly, would highly recommend. 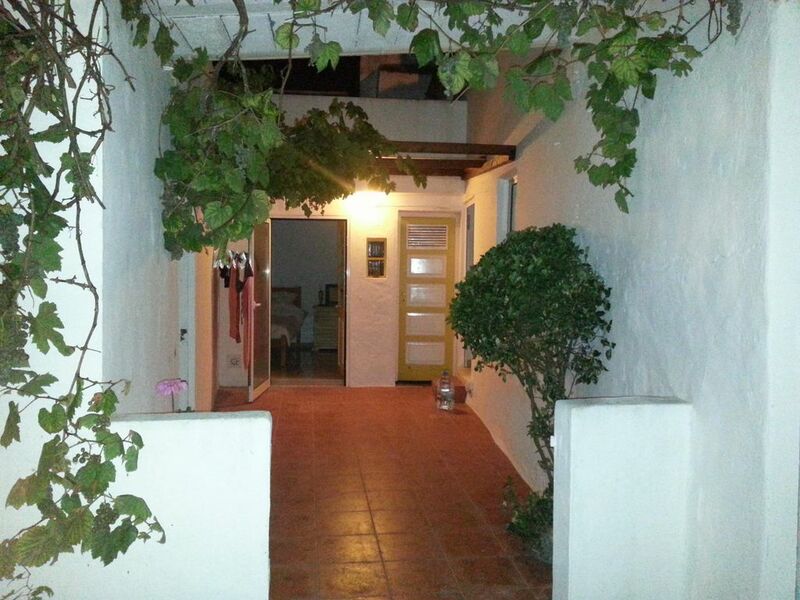 Located in a quiet village, but shops nearly and resorts only 5 minutes. Food was fantasticin the local restuarant. I have visited this lovely village home twice now, once in 2011 whilst renovation was nearly complete and in 2014 where it has now been completed to offer a lovely 2 bedroomed villa with upstairs studio and terrace area. Potentially could sleep 8. Just over an hour from the airport a car is recommended to see all on offer in this most beautiful area on Portugal. The house is tucked away from the main road hence is quiet and very private. The terrace upstairs is fantastic for chilling, eating and sunbathing, the veiws from this area are fabulous. The village resteraunts are lovely and especially value for money. The local grocery shops are sufficient for self catering needs with larger stores just a few miles drive away. There are many beautiful beaches within a few miles either reached by car or rambling. The area has a lot to offer those who like to explore the real Portugal. The villagers are happy , friendly and accomodating and above all it safe. This home would be suitable for a family with children of all ages and also great for a quiet get away for a couple or even alone. There is everything you need to make your holiday what you want : Towns with resteraunts and beaches or quiet lazy hideaways for a compleley chilled break. I love this part of Portugal for its rough and exciting coast line with amazing surf and fantastic sands. If you want to get away from 'commercialised buz' this is the destination for you - the Real Deal. Soweit alles sehr hübsch, allerdings darf man nicht empfindlich sein, was Gerüche angeht. Rustikal insofern, dass der Haupttrakt ursprünglich ein altes Bauernhaus ist, was man auch riechen kann. Das Schlafzimmer, das direkt vom Hof abgeht hat kein Fenster. Deswegen 3 statt 4 Sterne. The beautiful quite location of Salgado Beach is just 4 mins drive and stretches for about 6 km and is surrounded by cliffs and the heights of Serra da Pescaria and Serra de Mangues. Very popular spots for hang gliding and ultra-light enthusiasts, the strong waves also attract surfers and body boarders and the beach is normally free from crowds. There are lifeguards on duty in season, the average seawater temperature in summer is 16-18 ºC. Nazaré still maintains aspects of its character as a fishing village, such as traditional dress, the wives in multi-layered petticoats, the fishermen in Check shirt and black stockings and the custom of drying fish on the beach. You can get an insight into their home lives, in the early part of the 20th century, at the Fisherman’s House Museum. This is a typical fisherman’s cottage , fully restored internally and externally by Manuel Águeda Limpinho and opened to the public in 1999. It is completely furnished down to household utensils and even miniature boats. Visit one of the Jewlels of portugal, the Picturesque village and the medieval castle, of Obidos. Just 15 minutes drive. A wonderful medieval experience. Lots of beautiful scenic walks and cycling through forest and sea views.